Dave Frishberg has written dozens of delightful, artfully crafted songs, among them “My Attorney Bernie,” “Peel Me a Grape,” “Do You Miss New York?” and (with Bob Dorough) “I‘m Hip.” He also wrote the classic Schoolhouse Rock tune “I’m Just a Bill,” a virtual civics lesson in lyrics and music, explaining the process by which a bill wends its way through Congress to finally become a law. And now he’s written a book, a memoir of his life in jazz as a pianist, composer and lyricist. Turns out Mr. Frishberg, as well as being a wonderful songwriter, is a delightful storyteller. And like his song lyrics, his stories are filled with wit, insight, and eloquence. Oh, and lest I forget, the book comes with a bonus: You get not just the book, but a link to 21 classic Frishberg tunes, each file playable and downloadable to your music collection. The music alone is worth the price of the book. Dave Frishberg grew up and went to college in St. Paul, Minnesota, later serving in the Air Force in Salt Lake City before launching his career as a pianist and songwriter in New York City and, later, Los Angeles. My Dear Departed Past details a fascinating career in jazz during the years many consider the genre’s best. A knowledgeable musician, Frishberg would be considered well-educated by anybody’s standard, even though he was largely self-taught. When just in elementary school, he received his earliest “lessons” from his brother Mort, who was David’s senior by seven years and was able to teach his younger brother how to play some boogie-woogie and blues on the piano. Armed with these fundamental skills, Dave expanded his education listening to the music of Count Basie, Benny Goodman, Duke Ellington, Ella Fitzgerald, and Bing Crosby on Mort's 78-rpm records and reading about jazz in DownBeat and Metronome magazines. 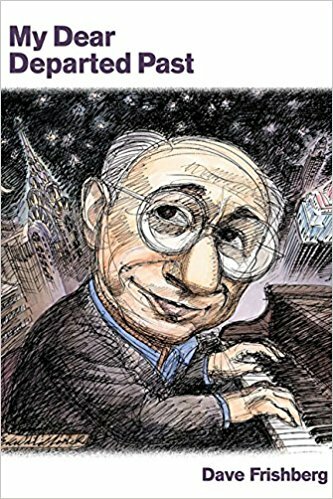 Frishberg tells of reading Mezz Mezzrow’s book, Really the Blues, being so inspired by it that he decided he, like Mezzrow, was a traditionalist, that anything other than Mezzrow’s choice of music was just “commercial” stuff, unworthy of serious attention. And this new music called “modern” or “progressive“ jazz must not be jazz at all because it was unrelated to New Orleans jazz and must be inauthentic. But one night, he was talking with a trumpet player he knew, and raving about his favorite trumpeters, Muggsy Spanier and Wild Bill Davison. “Never heard of him,“ responded the traditionalist. Dave’s friend went on to explain that the modern musicians played extensions off the chords—or “changes,” as he called them. Dave mentioned that he’d heard a Charlie Parker recording of the tune “Ornithology” and didn’t really understand it. “Why, it’s nothing but ‘How High the Moon,’” his friend explained. That night, the young Frishberg went home and listened to the recording again, and, as he tells it, “it was like the sun had broken out of the clouds,” and he comprehended for the first time what the modern players were doing. Absorbing this new lesson, Dave’s view expanded dramatically, as did his musical conception forever.